Farm Fresh | Farm Fresh, Iowa Farm Bureau’s blog about the people who bring you your food, fuel and fiber and the issues they face. We’ve moved the Farm Fresh Blog to a new website – IowaFarmBureau.com/FarmFreshBlog, and we’d like you to join us! Please visit the new site, bookmark it, and check back regularly for the latest stories about the people who bring you your food, fuel, and fiber and the issues they face. Or, better yet, subscribe to receive new blog posts in your inbox. For more than seven years, Iowa Farm Bureau’s Farm Fresh blog has offered insights into farming’s relevance to all of us. That won’t change! We’ll be shutting down the old website (https://iowafarmbureau.wordpress.com/) soon, so say farewell to the old site and hello to an even better viewing experience (with the same great content) on the new IowaFarmBureau.com/FarmFreshBlog ! Nestled in the very northwestern corner of Illinois, you will find the place I call home. It is where I spent hours in a wagon pulled by my older brother’s pedal tractor; where I fought with him over the “good” buddy seat, and hooked up our farm dog to my first tricycle in hopes of a wild ride. It is the place where the summer baby sitter was a Polaris Ranger, bottle calves were first pets, and hauling hay was a fun, anticipated event. It is the place where I decided who I wanted to be when I grew up and what I wanted to do. It is where my journey began. I have worn the “sacred” blue corduroy FFA jacket, raised chickens, pigs, and cattle and walked across the stage at my high school graduation. I have ventured beyond Illinois’ state lines and into the classrooms of Iowa State University where I am double majoring in Agricultural Communications and Public Service in Agriculture and am currently interning in the Marketing and Communications division of the Iowa Farm Bureau. Yes, that’s right; I am pursuing a career within the agriculture industry, which, despite my fond memories growing up on the farm, isn’t what I had expected. When asked what I wanted to be when I grew up, I used to say, “a nurse, an artist, or a ballerina.” Never in a million years did I think I would be an agriculturist. That was definitely my older brother, whose answer was always, “I want to be a farmer.” I never had any intention of pursuing a career that would take me back there. After all, isn’t an agriculturist a farmer; a guy who wears bib overalls, boots, and a hat? Maybe you have a similar notion of agriculture, based on its history, where women assumed supporting roles versus operational or strategic business roles. Here in Iowa and beyond, I’m proud to have met so many women who are breaking these barriers and paving a new and unique place in an industry which was once thought of as strictly “a man’s world.” They are now the faces behind seed counters, tractor wheels, and blogs. They are becoming industry leaders too, as 10 Farm Bureau County Presidents in Iowa are currently women and even more are taking on other leadership roles within this organization every year. It’s welcome news for young professionals like me, who are working to find their own place in agriculture. 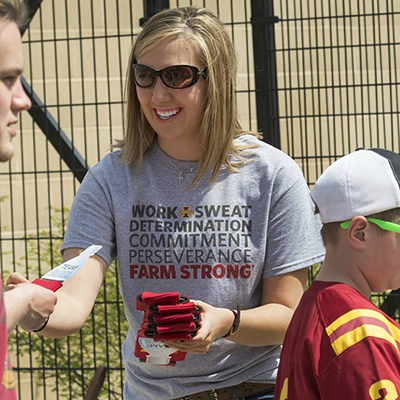 Chloe greeting Iowa State Cyclone fans with farm and water quality facts at Jack Trice Stadium in Ames, Iowa. Laura Cunningham of Floyd County Iowa is an active participant in her family’s farming operation. She’s just one of the many women breaking barriers in agriculture. “If you were a woman previously in the agriculture industry it meant you were helping out on a family farm, but today women now have the opportunity to take on leadership roles professionally as well as add in some entrepreneurial practices,” she says. I agree! Opportunity is the deciding factor for entering this industry; we have to seek it out or make it. My advice to other young women and girls on farms today, hauling hay, feeding calves and vying for time behind the wheel of the family tractor, is to make a plan and decide today who and what they want to be. Seek out organizations like the Iowa Farm Bureau who have programs that can help you develop that plan, whether that’s Farm Bureau’s Take Root program, Renew Rural Iowa or Young Farmer program. Don’t let history and the stereotypes too often associated with our industry stop you. Agriculture is no longer a man’s world. It is a world filled with diversity, passion, opportunity and WoMEn. By Chloe Carson. 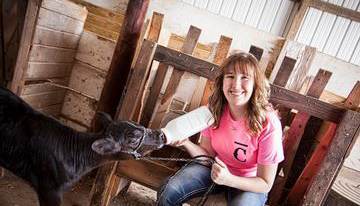 Chloe is a marketing and communications intern for the Iowa Farm Bureau. 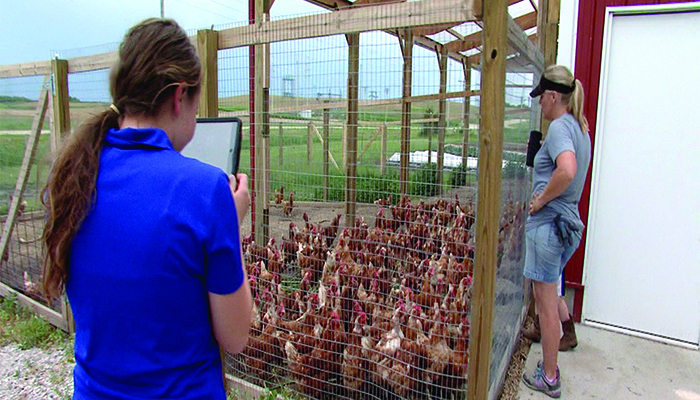 Technology is helping Iowa agriculture bring school kids and others right to the farm. And there’s no need to worry about sunburns, bug bites or long trips on the bus. Instead of traveling across several states, or 1,450 miles and 21 hours by bus, kindergarten students at Kermit Booker Elementary School in Las Vegas took a virtual field to some Iowa farms recently. Following a classroom unit about farming and agriculture, teachers wanted to give their students an opportunity to visit the farm. But the school’s budget and the time it would take to travel to the farm wouldn’t allow for a one-on-one visit with the farmer in Iowa. Instead, the school’s digital learning coach at the school, Mark Thomas, had an idea. He went to Google and searched “virtual tour of a farm” and found the Iowa Farm Bureau’s Ag in the Classroom program in Polk County. There, he was able to connect to the coordinator of the program, Gretchen Voga. Voga determined which type of farms the class wanted to visit and set up the classes up with a live tour of a cattle farm and a farm that raises chickens, flowers and vegetables. This experience for kindergarten students in Las Vegas is only one example of the types of tours farmers are opening their doors to. In fact, the Farm Chat program concept was developed by a farmer who had a Skype conversation with his daughter who was traveling abroad. Farmers enjoy sharing their farm to visitors, but the Farm Chat concept allows farmers to keep their animals, as well as visitors, safe. And for inner-city schools, like Kermit Booker Elementary Schoo,l with a limited budget, it allows students to have a different experience with no cost. And it’s not just schools in other states who have inquired about virtual farm visits. Schools within 50 miles of the farms have taken a virtual tour for various reasons. “It’s a great way to get around the field trip logistics and cost so kids (and schools) don’t have that. On the farm end, they don’t have to deal with the liability issues,” Voga said. And in the case of livestock farms, farmers don’t have to worry about biosecurity concerns, she said. For the Las Vegas students, the first stop on the tour was the Anderson Farm. There, Laura Anderson Loots, a Boone County Farm Bureau member, explained that she and her family raise cattle and crops on their century farm. On her farm, Loots showed the kindergarten students her 12 cow/calf pairs and pointed out a corn field. Loots, along with her brother and father, raise corn, soybeans, oats and hay. They also grow sweet corn for Birds Eye. Laura also has some broiler chickens and laying hens on the farm. On the other end of the Google Hangouts connection, kids shrieked in excitement as they heard the moo of the cows. Shortly after Loots’ farm tour, Nicole Jonas of Red Granite Farm came through on a Skype connection to show the students her chicken, vegetable and flower farm. The new flock arrives in early April each year and starts laying in August. For a few months of the year, there will be more than 400 hens laying, which can turn out around 30 dozen eggs a day. The family sells nearly 100 dozen eggs to Burgie’s Coffee and Tea Company in Ames each week. The Story City Locker also sells their farm fresh eggs. The Jonas family also has 3 acres in vegetable production, which they sell at the Downtown Ames Farmers Market and the North Grand Farmers Market, and grow 5,000 perennials every year, which they sell on their farm. “Since it’s just me and the iPad and the farmer, the kids get to go inside the livestock building, they get to see how they’re fed, how they’re watered,” Voga said. Thomas said the students loved their tours of the Iowa farms. “They were able to hear actual farm animal sounds and see animals,” he said. And it enhanced the learning experience in the classroom. “It was awesome because it confirmed some of the things we’d been talking about in class. It’s one thing to talk about what it’s like on a farm, it’s another for the kids to see that live and how it really happens. They don’t have the opportunity to see live cows or tractors or the fields, so to actually see that and how it worked really made a difference,” Thomas said. Check out the video below of the tour on Red Granite Farms. By Bethany Baratta. 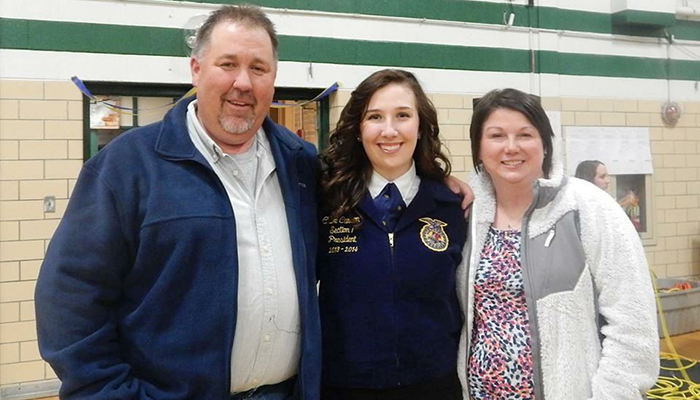 Bethany is Iowa Farm Bureau’s commodities writer. Can somebody be both a backer of biotechnology in agriculture and a supporter of organic farming? I think so. In fact, I see myself as one. I’m a pretty big backer of biotech agriculture. I’ve seen first-hand how by choosing to use genetically-modified crops, farmers in Iowa and around the world have been able to produce bigger and better harvests, with less adverse impact on the environment. And I think there’s immense promise in biotechnology for agriculture, especially in places of the world where food shortages and malnutrition are chronic. On top of all that, study after study shows that foods made with biotech crops are safe for consumers and are not different from those developed with traditional plant breeding. The latest was from the National Academy of Sciences, which looked over reams of data and concluded that biotech crops are safe and provide many benefits for farmers and the environment. Still, my strong support for biotech or GMOs doesn’t keep me from supporting organic agriculture. I know many Iowa farmers who choose to raise crops organic crops or forage on some, or all, of their land. It’s clear that some consumers prefer organic products and are willing to pay farmers more for them. The organic market is also important for many farmers, young and old, who are starting out without a lot of land and need the added income from the premium prices offered by organics. The problem sprouts up when advocates of organic or conventional farming, trying to bolster their side, start to denigrate the other. There is no place for “farmer shaming,” as one of my correspondents aptly pointed out to me recently. It is unfair, unproductive and causes unfortunate divisions. 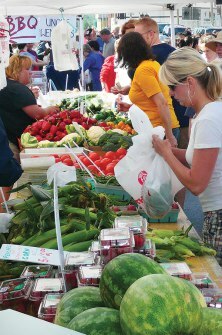 The bottom line: Iowa is a great farming state with plenty of room for all types of agriculture, whether that’s conventional, organic or one of the wide range of variables in between. By Dirck Steimel. Dirck is News Services Manager for the Iowa Farm Bureau Federation. The National Academies of Sciences, Engineering, and Medicine just published an extensive report reviewing more than 900 GMO studies and data covering 20 years. Among the conclusive findings: food from GMO crops is just as safe as food from conventionally bred crops and it poses no added risk to the environment. Naturally, GMO opponents like celebrity talk show host Dr. Oz sighed in relief and immediately reversed their efforts to stigmatize GMOs. A day after the report was released Dr. Oz appeared on the Today show to address the study. With egg on his face, Oz brazenly claimed the report “validated” many of the things he’s been saying for years, picking around the report’s definitive language, raising doubts, and saying that we need to keep studying the issue. Talk to a scientist who works in this field. They’ll tell you GMOs are more thoroughly tested than any product produced in the history of agriculture. Yes, we should continue to study GMOs. Why would we stop? It does, but it’s certainly not new information. The report pulls from 900-plus existing studies and echoes what the Academies, American Medical Association, World Health Organization, FDA, and host of other scientific bodies have been saying about GMO food safety for years, as any “doctor” who speaks out on this topic would surely know. A doctor who professes to know about GMOs should also know that GMO technology allows farmers to grow food with better nutritional characteristics, such as high oleic soybean oil that has zero grams of trans fat and lower saturated fat than traditional soybean oil and “golden rice,” a genetically modified crop that allows the plant to produce vitamin A, a nutrient that affects (among other things) vision and is severely lacking for millions of people in Asia and Africa. He may also know that GMOs have helped farmers reduce pesticide applications and have created other environmental benefits. Oz’s willingness to dismiss these facts (again, they’re not “new”) and instead, try to cast a shadow over them does a disservice to consumers by intentionally spreading fear. It also clearly shows his lack of respect for scientific proof. 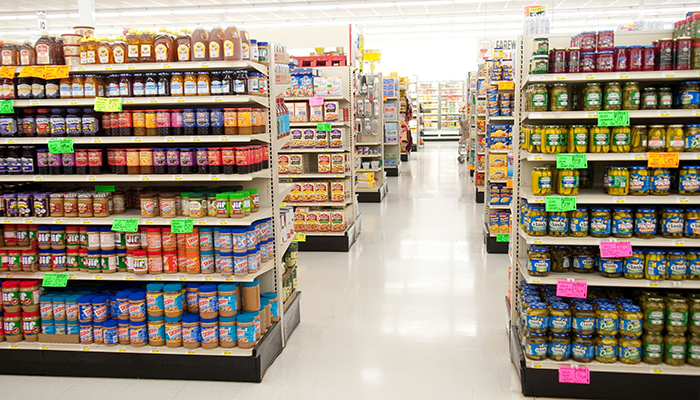 Without science, we’re left with ideology, which today’s consumers are certainly entitled to. But we should expect more scientific objectivity from individuals who’ve elevated their voices in the public discussion based on their scientific or medical credentials. I recently read that Des Moines Water Works is creating a one-acre wetland test site to help remove nitrates from the Raccoon River (which provides drinking water for central Iowans). You don’t need to look any further than Iowa’s own three-year old Nutrient Reduction Strategy (a collaborative, research-based solution for improving water quality) to see that it’s a good idea. The state’s water quality initiative cites wetlands (“nature’s sponges”) as a proven practice to help filter nitrates out of water. 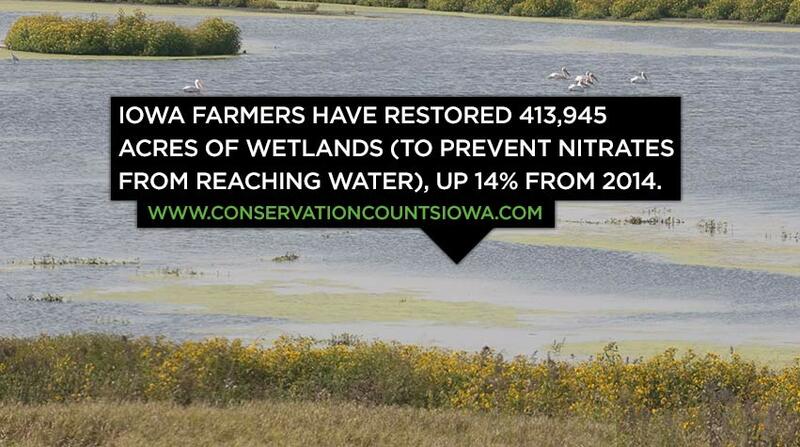 Farmers agree and have been restoring wetlands on their own land for years. In 2016 Iowa’s restored wetland acres have grown to 413,945 – a 14 percent increase since 2014! 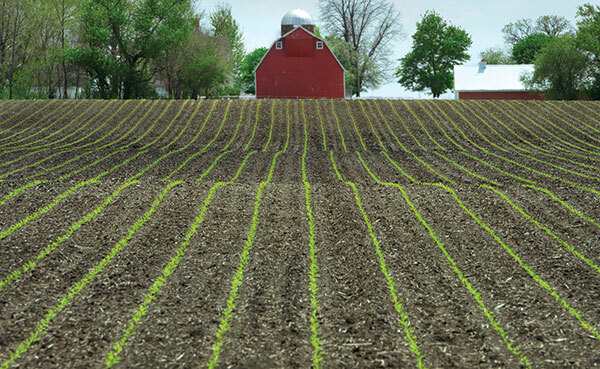 Nitrates are naturally-occurring and abundant, especially in Iowa. They’re the reason Iowa is known for its fertile soil, and a number of factors, including excess rainfall like we’ve seen recently, can impact the level of nitrates in the water. That doesn’t mean we’re toast. It’s no different than going up against a formidable opponent on the basketball court – you’d better have a plan, pull together, and dig deep. That’s why the state’s comprehensive, research-based Water Quality Initiative is so important. It includes a suite of proven practices to help improve water quality, with progress measured and reported by Iowa State University researchers. Teams of individuals, organizations, and communities are collaborating to implement it. We’re seeing it around the state, in places like Cedar Rapids, Rathbun Lake, Hewitt Creek watershed, Griswold, and Sioux Center, and the list is growing. It’s also working. Cover crops, for example, are another practice outlined in the strategy. Iowa has seen more than a 4,600 percent increase in acres planted with cover crops since 2007. Just look at the number of stakeholders and watershed projects around the state collaborating to improve water quality. Challenges remain, and farmers are taking them on, but to be truly effective, it will take everyone working together. We all have a role. The team must grow; the momentum must build, even if it’s one person, one community, and one acre at a time. This Sunday, I will be celebrating Mother’s Day with a whole new perspective – as a first-time mom to an amazingly perfect little girl. Back when I was a kid, my dad used to warn me not to get between a mama cow and her calf out in the pasture, because the cow will trample you. Now I know how the cow feels – overprotective to the extreme. I’ve learned that “mom guilt” isn’t just a clever Instagram hashtag; it’s all too real. I can’t count how many times a day I google information on whether my baby is sleeping too much or not enough, whether it’s OK to give her a pacifier, if I’m putting her in the car seat correctly or whatever little worry that pops into my head. And like every mom, one of those worries is whether she’s eating well and growing like she should. When you’re a soon-to-be mom, a lot of formula companies send you samples and coupons in the mail. I was sent a free sample of a non-GMO (genetically modified) formula. And after our daughter was born, the hospital gave us more free samples of the same non-GMO formula, which I assume they got as a promotional gift from the company. I know from talking to experts like Dr. Ruth MacDonald, professor chair of food science and human nutrition at Iowa State University, that there is no difference nutritionally between foods made with genetically modified corn and soy ingredients and those that are non-GMO. But there is a difference in price. The non-GMO formula is more expensive, and those formula costs add up quickly during the baby’s first year. I’ve compared the labels on both the non-GMO and conventional baby formula, and they are nearly identical in nutritional content. So as long as it has the vitamins, protein, etc., that my baby needs, I’m comfortable feeding her the conventional formula as recommended by our pediatrician. Yet I wonder if other moms pay the extra money for formula labeled “non-GMO” because of the mistaken belief that it’s healthier for their babies. A few months back, I read in disbelief a New York Times article (http://parenting.blogs.nytimes.com/2015/10/07/what-does-organic-mean-for-baby-formula/) about one mom’s worries that organic formula wasn’t “organic” enough for her baby. She ended buying an expensive formula shipped in from Europe. I understand all too well the endless worries and lost sleep when it comes to caring for our precious babies. But whether the formula is made with GMO ingredients is not one of them. As long as the formula is proven safe, it is approved by our doctor and our baby girl is eating and growing like she should, I’m OK with my choice. Instead, I’ll worry about what I can control, like keeping food safety in mind by refrigerating the formula properly and washing my hands before touching the baby’s food. When we first brought baby home, I asked my own mom if I’ll ever stop worrying about my daughter. She told me that even when your daughters grow up, you never stop worrying. It melted my heart to hear her admit that. So happy Mother’s Day and thanks to the moms and grandmas for all you do to care for your babies, throughout life and beyond. Like those calves out in the pasture, we will always be protected by our mamas. By Teresa Bjork. Teresa is senior features writer for the Iowa Farm Bureau Federation.